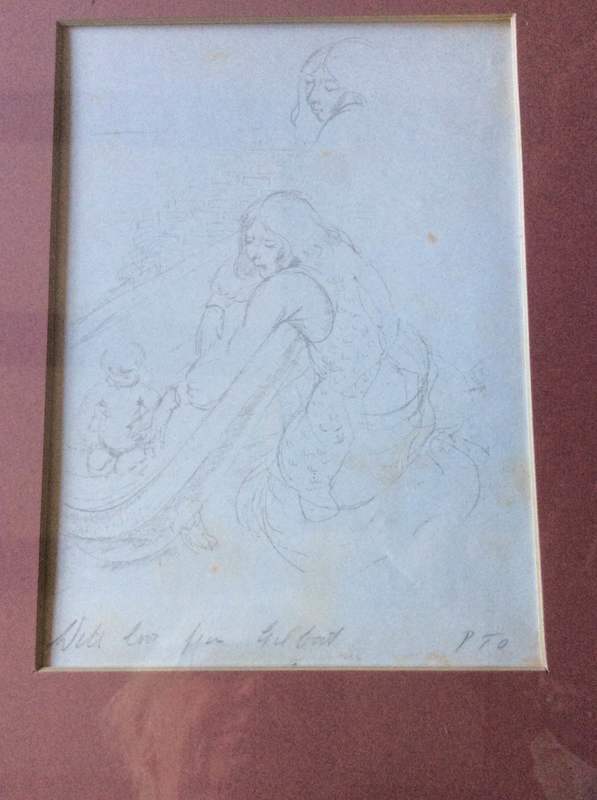 I have an oil painting entitled “The Gardener’s Daughter from Aynhoe” by painted by Mrs MacLean, the wife of Hugh, and also a beautiful sketch of a mother bathing a baby by Gilbert Spencer; the Spencer family are well known in art circles. Both of these were given to me by Rev. Hugh MacLean who was the vicar for Deerhurst parish from 1938 until the nuns took over. I say here that I really enjoyed his visits. I had four children under the age of 5 at that time so it was nice to have adult company. This was a time of no internet, mobile phones etc and he converted me to Anthony Trollope and Barchester Towers. I maybe converted him to the poems of Matthew Arnold. My poetry book was destroyed in a fire, and he arrived with his school book and gave it to me (see attachment) It is a much loved and treasured book still. I digress. Back to Aynhoe, Northamptonshire. On our recent holiday we saw the sign to Aynhoe so we decided to call and see the church. I knew Mrs MacLean was a Cartwright (Lords of the Manor family – you can google Dame Mary Cartwright, Mrs MacLean’s sister, of Girton College, Cambridge to learn more) When she visited Deerhurst it was action stations for all of us. Poor Dinah must have been and cleaning for weeks. All the parishioners were told to be on their best behaviour! All the time we knew “The Vicar” we were told by him that he wanted to be buried at Deerhurst near the previous vicar, George Butterworth (1856 -??) At his memorial service at Deerhurst taken by his nephew Alan, also a vicar, said that Hugh had definitely and positively changed his mind and he wanted to join his wife who was buried at Aynhoe. Hence our visit (see attached headstone) to a wonderful atmospheric and unmodernised church which still have blocked pews and is well worth a visit. A lovely lady, doing her cleaning today as she couldn’t make Thursday, directed us to the porch where there was a list of grave names and plot numbers. We found the name MacLean, no plot numbers as all others, but just next to the cross. On finding the cross as directed by the groundsman/ church warden, we found a stone on the grass with moss covering the lettering. We deciphered the last name, Hugh MacLean 1907-1981, under In memory of the Cartwrights. We have so many stories of this vicar so full of character. We always knew we would have short sermons when there was a BBC production that he enjoyed was on TV on a Sunday evening. Quite a few when the Forsythe Saga was on! He and his wife drove a Morris Tourer and always drove around our golden retriever who refused to move from the middle of the road. He did so because our dog had a better smile some of his parishioners! He walked down the river every afternoon and returned with “jetsam” carried on his back in a hessian sack. When he moved, his garage was full of such wood. On one occasion he hitched a lift with my husband, who was on a business trip to Brighton, to visit his cousin. On their return I enquired how it had gone? He replied “I can only describe it as a moving experience.” He had never travelled at 100 mph before! He lived in a time of just having Deerhurst and Apperley parishes. I don’t think he would have enjoyed today’s system, and certainly would have not liked life through the medium of emails, tweets and Facebook update statuses. Those were the days!